Learn the fundamentals of English paper piecing in my newest class! Download the printable Supplies List if you need to pick up a few items at the store and print the Hexagon Templates so we can get started! I also added a BONUS Diamond Template sheet so you can apply your new skills to another shape once you've finished this class. UPDATE! Get my new Fussy Cutter's Viewfinder templates and more sizes of hexagons HERE on my blog! The two downloads available on my blog coordinate and work together perfectly. See what I'm working on behind the scenes and catch sneak peeks of my next class on Instagram @aperseveringmom! 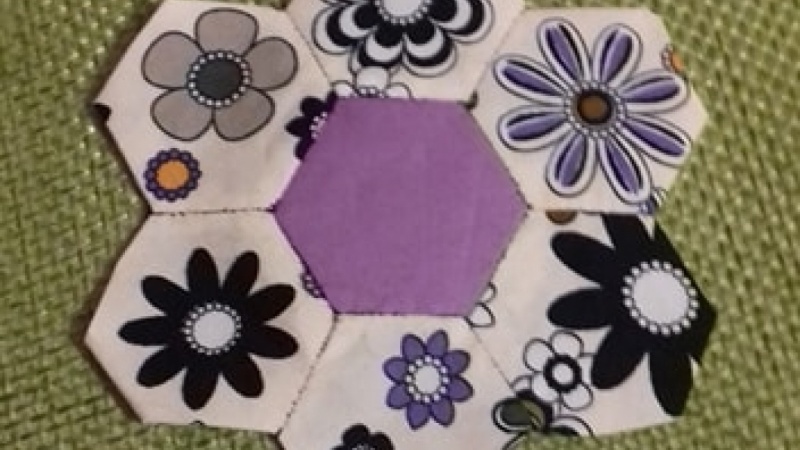 Your class project is to complete one hexie flower. Add some extra bling to your block by fussy cutting each piece. Post your progress and final product here. I'm a wife, a mom and a maker. Sometimes a quilt-maker, sometimes a craft-maker, always a mess-maker! Foundation Paper Piecing Basics: Create a Butterfly Quilt Block! DIY Simple House Number/Planter Box: Beginner Friendly!